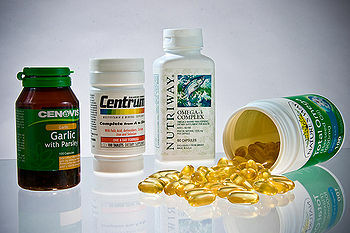 Vitamins are now available in numerous commercial supplements, already portioned into the necessary daily dosages. The word vitamin "vitamine", coined by Polish scientist Cashmir Funk in 1912, comes from the words "vita", meaning life in Italian, and "amine". from thiamine where vitamins were first discovered. However, over the next century the word "vitamine" was shortened to vitamin. If a human did not take any vitamins at all, they would die within a month. This is because vitamins are used by the body to: help clot the blood, assist in chemical reactions, maintain proper health, and perform many other tasks that the body requires. Oranges and lemons were used on ships in order to prevent scurvy. Since the middle ages, people have known that there were factors in different foods that influenced people's health. However, they did not know what they were or how they worked, they just knew that certain foods would prevent certain diseases. One of the most well known example was aboard ocean going ships. Since ancient times, scurvy was a major hazard on long sea voyages, and nobody knew how to stop the disease. However, in 1747 James Lind began to issue oranges and lemons to sailors, and scurvy was dramatically reduced. However, although his work stopped scurvy on ships it did noting to explain why it worked. The molecular structure of Vitamin B12, the most extensive and complex of known vitamins. Beginning in 1905, Doctor William Fletcher reached the conclusion that certain factors can prevent people from getting sick. He arrived at this conclusion while trying to find a cure for the disease Beriberi. In his study, he found that when someone eats unpolished rice it prevents the disease, but people who ate polished rice were infected with the disease. He reached the conclusion that a factor is present in the unpolished rice which is essential for good health. Then, in 1906 Sir Frederick Gowland Hopkins, an English biochemist, discovered that certain factors present in food were necessary for good health. Following up on their work, Polish scientist Cashmir Funk named the factors vitamins in 1912. In addition to discovering the vitamins, scientists began to work on synthesizing them. The majority of the vitamins were created before, or during, the 1950's. However, because of its complex chemical structure, vitamin B12 was not discovered until 1964. There are two broad classifications of vitamins and they are: fat soluble and water soluble. The four fat soluble vitamins are:A, D, E and K. Fat soluble vitamins are dissolved through a layer of fat before they enter the bloodstream. After being transported through the bloodstream the vitamins end up in the liver where they can be stored for long time periods. Because the body stores these vitamins, megadoses of fat soluble vitamins can lead to complications such as: muscle weakness, vomiting, excessive bleeding, dehydration, and other problems. These problems result because the body stores the vitamins rather than eliminating them, which happens to water soluble vitamins. In addition to remaining in the body, the average human requires no extra vitamin supplements because the doses they need are already in a normal diet. Also, the body does not require these vitamins every day and will use the vitamins is has stored in the fat tissues until they need to be used. Another important difference between the two types of vitamins is the durability of fat soluble vitamins. When the foods that contain vitamins A, D, E and K are washed or cooked the vitamins remain in the food. This factor remains with the vitamins even when they are ingested, because the vitamins will stay in the body for long periods of time, rather than being expelled after one day, as water soluble vitamins are. Water soluble vitamins include: B-complex and Vitamin C. Vitamins in the B-complex contain eight of the nine water soluble vitamins. These vitamins are fairly easy to destroy, even washing the food that contains them will remove them. In addition to being easily destroyed, these vitamins are not stored in the body. This means that if someone takes a megadose of vitamins the body will excrete them. Water soluble vitamins must be taken each day, because the body will excrete them from the body rather than storing them. Water soluble, as their name suggests, dissolve in water. After they dissolve, they are immediately used by the body, or are filtered out and placed in urine. While taking a megadose of water soluble vitamins is not recommended, it will not be fatal. However, a lack of water soluble vitamins can quickly kill the individual. This is because water soluble vitamins are essential for life, while fat soluble vitamins are to keep someone healthy. 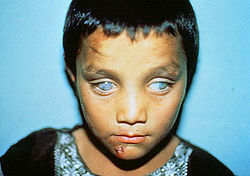 A picture of someone who suffered from Vitamin A deficiency, which resulted in corneal scarring. Vitamin A-- Improves vision adaption to darkness, regulates gene expression, strengthens immunity, aids growth and embryonic development, and improves red blood cell production. Deficiency results in poor night vision, susceptibility to infections, and possible birth defects. Fresh fruits and vegetables each offer their own wide range of required vitamins. Vitamin A is found in: cod liver oil, sweet potato, pumpkin, carrot, cantaloupe, spinach, kale, collard, and butternut squash. The body requires from 300 mcg/day in children to 900 mcg/day in adult men and 700 mcg/day in adult women. Vitamin B6 is found in: fortified cereal, banana, wild salmon, turkey without skin, chicken (light meat), potato, and spinach. The body requires from 0.1 mg/day in children to 1.7 mg/day in adult men and 1.5 mg/day in adult women. Vitamin B12 is found in: clams, mussels, crab, salmon, rockfish, beef, egg, milk, and Brie cheese. The body requires from 0.4 mg/day in children to 2.4 mg/day in adults. Vitamin C is found in: oranges, grapefruit, strawberries, tomato, sweet red pepper, broccoli, and potato. The body requires from 15 mg/day in children to 90 mcg/day in adult men and 75 mcg/day in adult women. Smokers should take about 35% more Vitamin C than the average adult. Vitamin D is found in: salmon, sardines, mackerel, fortified milk, fortified soy milk, and egg yolk. The body requires from 5 mcg/day in children to 10 mcg/day in adults men, 15 mcg/day for the elderly. Vitamin E is found in: olive oil, soybean oil, corn oil, canola oil, safflower oil, sunflower oil, almonds, hazelnuts, peanuts, and avocado. The body requires from 4 mg/day in children to 15 mg/day in adults. Vitamin K is found in: soybean oil, canola oil, broccoli, kale, spinach, leaf lettuce, Swiss chard, watercress, and parsley. The body requires from 30 mcg/day in children to 120 mcg/day in adult men and 90 mcg/day in adult women. Biotin is found in: yeast, egg, cheddar cheese, liver, pork, salmon, and avocado. The body requires from 5 mcg/day in children to 30 mcg/day in adults. Folic Acid is found in: orange juice, spinach, asparagus, lentils, garbanzo beans, lima beans, bread, pasta, and rice. The body requires from 65 mcg/day in children to 400 mcg/day in adults. Niacin is found in: chicken (light meat), turkey (dark meat), beef, salmon, tuna, bread, cereal, pasta, peanuts, lentils, and lima beans. The body requires from 2 mg/day in children to 16 mg/day in adult men and 14 mg/day in adult women. Pantothenic Acid is found in: chicken, egg, milk, yogurt, broccoli, lentils, split peas, avocado, sweet potato, raw mushrooms, and lobster. The body requires from 1.7 mg/day in children to 5 mg/day in adults. Riboflavin is found in: fortified cereal, milk, cheddar cheese, eggs, almonds, salmon, chicken (dark meat), beef, broccoli, asparagus, and spinach. The body requires from 0.3 mg/day in children to 1.3 mg/day in adult men and 1.1 mg/day in adult women. Thiamin is found in: lentils, peas, long grain brown rice, long grain white rice, whole wheat bread, fortified breakfast cereal, pork, Brazil nuts, pecans, orange, cantaloupe, and milk. The body requires from 0.2 mg/day in children to 1.2 mg/day in adult men and 1.1 mg/day in adult women. ↑ 1.0 1.1 1.2 1.3 Bellis, Mary. Vitamins- Production Methods About.com. Web. Accessed on April 20, 2013. ↑ Vitamins Medline Plus Web. Accessed February 6, 2014. ↑ Linus Pauling Institute. Micronutrient Information Center Linus Pauling Institute: Micronutrient Research for Optimum Health Web. Accessed on 5/713. ↑ Collaboration by News Medical. Vitamin C History News Medical. Web. published in 2012. ↑ Unknown author. Vitamin B12 Advameg, Inc.. Web. accessed on 4/24/13. ↑ Edited by Ever, Allison. Vitamins NLM. Web. Updated 2/8/11). ↑ 7.0 7.1 Moore, R and Bellows, L. Fat-Soluble Vitamins: A, D, E, and K Colorado State University. Web. Published 11/12. ↑ 8.0 8.1 Moore, R and Bellows, L. Water-Soluble Vitamins: B-Complex and Vitamin C Colorado State University. Web. Published 11/12. This page was last modified on 14 August 2015, at 16:36.